Whether you are on the ladder, under the car or in a tight work space, the Tool Band-it arm band guarantees you’ll have the right tools when and where you need them. Stop holding nails in your mouth and put an end to dropping, dragging and stretching. Keep any project organized and never misplace those small parts and pieces. The Tool Band-it even cleans up after itself, holds up to 25 pounds and turns a two person job into a task simple enough for one person to tackle. If you’re tired of fumbling with your tools and wasting valuable time, try the Tool Bandit today! 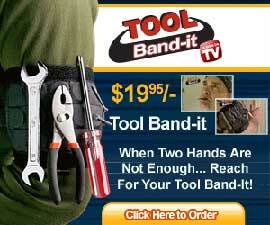 The Tool Band-it flexible and lightweight magnetic arm band provides a safe place to keep all of your tools and parts. Its powerful space age magnet technology securely holds wrenches, screwdrivers, nuts, nails, bolts and even a heavy hammer-all at the same time! Perfect for carpentry work, mechanical jobs and do-it-yourself projects. And the Tool Band-it isn’t just for men. It can also be used for gardening, decorating, crafts and much more. Now you can keep your tools and parts within easy reach at all times!